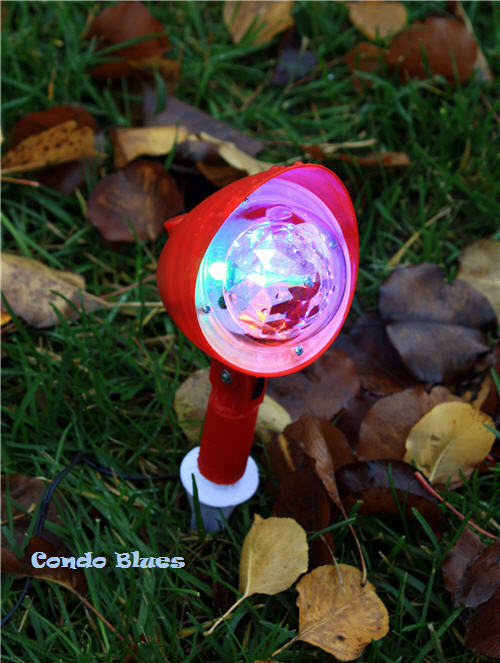 Condo Blues: How to Decorate a House with Christmas Lights in 15 Minutes or Less! 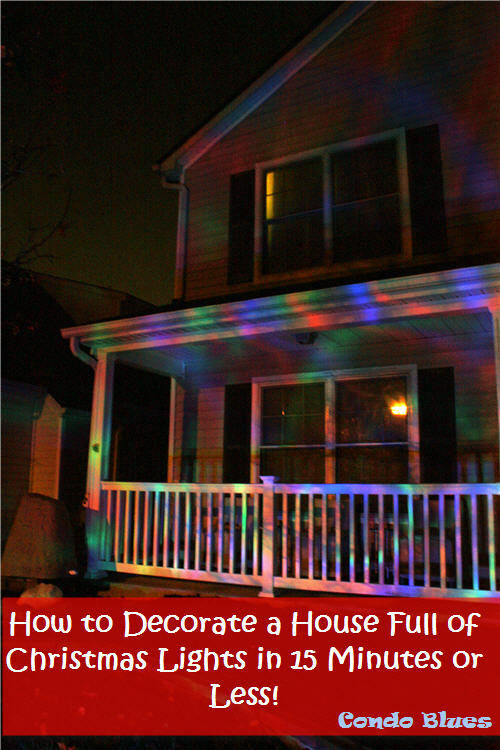 How to Decorate a House with Christmas Lights in 15 Minutes or Less! I like decorating with Christmas lights. I admit my Christmas light obsession may not be very green, but I never promised you a perfect green life, just an honest one. I honestly like the look of a house full of Christmas lights. I also honestly hate standing in the snow and cold putting away a house full of Christmas lights after the holiday. The weather is always colder when the outdoor Christmas decoration have to come down than when they go up. That’s our motivation behind decorating our house with lights only on the porch rails. This year, I found a way to decorate a house full of energy saving Christmas lights and it only took 15 minutes! It will take even less time to take them down after the holiday. Woohoo! 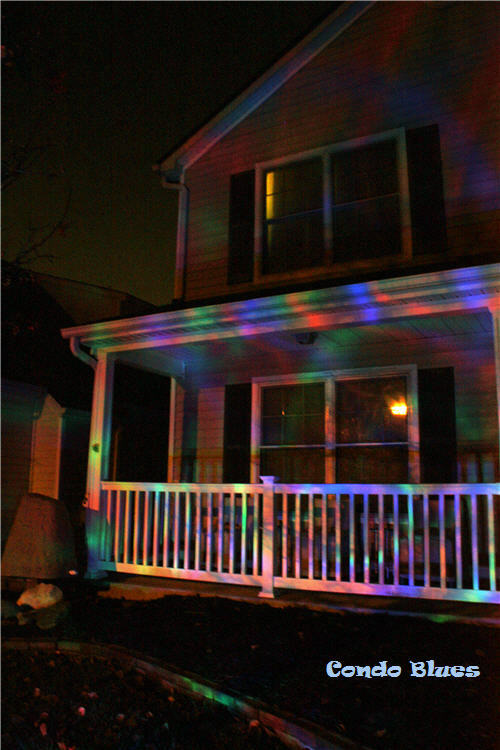 I bought an LED Christmas light show projector to cover our house in multicolored lights (Husband’s favorite.) It is easy and simple to set up (my favorite) and hopefully will last longer than the year or two we get out of LED string lights. I can't tell you irked I get when I buy LED string lights hoping to save electricity and resources only to keep replacing them while our incandescent Christmas string lights are still going strong. Does that happen to you? Our Christmas light projectors came with three projectors but our house is so small we might have gotten away with two. All I had to do was stake the projectors into the ground, point them at the house, and plug them in – instant Christmas light décor! It's light a Christmas disco dance infereno landed from outer space and into the front yard. There may have been dancing after I plugged the projector Christmas disco lights in for the first time. Jingle bell rock and roll Christmas lights! I took the lazy way out when it comes to turning our Christmas lights on and off. I always put our lights on a photoelectric outdoor light timer. The Christmas lights come on at dusk and stay on for 6 hours and automatically turn off. I used to set the timer from dusk to dawn but shortened the time to save on electricity after our Electricity Reduction Challenge. I bought my Christmas light projector locally and can’t find it on line although there is it similar to this Christmas light projector for sale on Amazon if you are interested. I'm not finished decorating outside for Christmas. The lights are the first step. Do you put up Christmas lights? What are your Christmas light decorating tips?